← How Can a Home Health Aide Help Your Elderly Loved Ones? When you have loved ones in need of special care and attention especially in their activities of daily living, you actually have a choice between placing them in facilities—such as retirement homes or shared residential houses for the elderly, and care facilities for individuals suffering from physical or developmental disability—or bringing the much-needed care and attention to them in the comforts of home. The great thing about the latter is that your loved ones will feel much more comfortable and at ease in the safety of their own homes. In addition to that, the kind of care, assistance, and support given can be personalized according to the specific needs of your loved ones. Home care service comes in many forms, and will depend on the specific needs of your loved ones, not to mention the level of independence your loved ones possess. For example, your elderly loved one may not need assistance in personal tasks such as bathing, grooming, and meal preparation, but may need help in light household work and errands. Whatever the need is, though, it is important to find people who are not only capable and competent enough to do their jobs, but are also attentive to the needs of your loved ones, and who are willing to lend a helping hand, a listening ear, and a genuinely compassionate heart. Healthwise Home Health Care, Inc. is a home health care agency in San Diego County, California that aims to improve the quality of life of senior citizens, or individuals suffering from illness, injury, or disability, through a wide array of quality services specialized for the needs of every client. Whether it be providing personal assistance, physical and occupational therapy, speech-language pathology, or even skilled nursing, we make sure to do it all with quality, efficiency, and dedication. 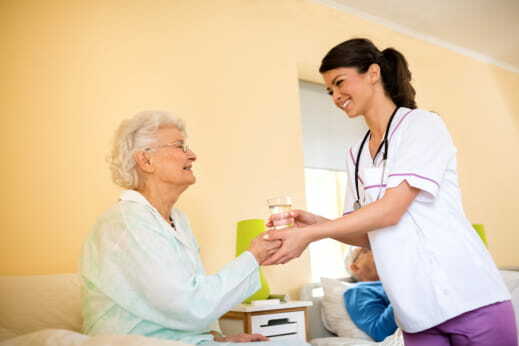 At Healthwise Home Health Care, Inc., each highly qualified and skilled therapist, pathologist, skilled nurse, and home health aide is trained to provide the services in their field of expertise to our clients, with precision and genuine care. Your loved ones will see our professional care providers to not only be their therapist, nurse, pathologist, or home health aide, but also their friend. With us, you no longer need to worry about giving the best care to your loved ones. All the care, support, and assistance your loved one needs can be provided without them having to leave the familiarity of home. Your loved ones will be comfortable and at ease, and you will also have peace of mind knowing that they are given the right, personalized home care they need. The next time you seek for home health care in National City, California, trust Healthwise Home Health Care, Inc.
Share this to a friend and give them the best option for providing home care for their loved ones. You may also call us at 619-474-4699 or 619-474-4698 to learn more about our services and how we can help you. This entry was posted in Home Health Care and tagged compassionate heart, Home Care, skilled nurse. Bookmark the permalink.